Disposable diapers are a popular consumer product, especially in the U.S. Although they offer convenience, they do have several dangerous environmental drawbacks. Not only do disposable diapers account for a lot of the trash taking over the nation's landfills, but they also pose serious risks to the environment and people alike. The Environmental Protection Agency reports that about 20 billion disposable diapers are dumped in landfills each year, accounting for more than 3.5 million tons of waste. The Good Human, a website dedicated to discussing issues related to environmentalism, points out that more than 200,000 trees each year are lost to the manufacture of disposable diapers for babies in the U.S. alone. In addition, it takes 3.4 billion gallons of fuel oil every year to make diapers. What it comes down to is that disposable diapers use 20 times more raw materials, two times more water and three times more energy to make than cloth diapers. Besides depleting natural resources, manufacturing disposable diapers also utilizes non-renewable energy sources. Although disposable diapers need to be exposed to oxygen and sunlight to decompose, they do not degrade well in a landfill. What's more, disposable diapers take about 500 years to decompose. The millions of tons of untreated waste added to landfills each year through plastic diapers can contaminate ground water. Another concern is that viruses excreted in a baby's feces could end up leaking into local water supplies. According to the Atmospheric Radiation Measurement Program, landfills are known for producing greenhouse gas emissions, which can contribute to the earth's climate changes. Decomposing diapers release methane into the air. High concentrations of the gas can be explosive and flammable. Methane is also dangerous to breathe in because it replaces oxygen. 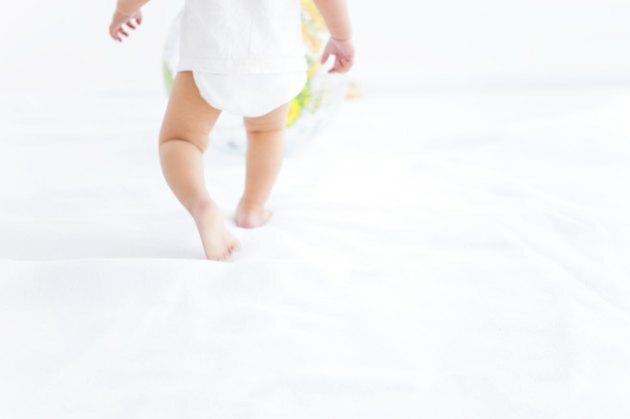 A guide published by the Environmental Health Association of Nova Scotia cites a study reported in the "Archives of Environmental Health" which found that diapers release volatile organic chemicals. Toxic chemicals such as toluene, ethylbenzene, xylene and dipentene have been linked to adverse health effects in humans with long-term exposure. The inner absorbent layer of a disposable diaper is also treated with chemicals, which can trigger allergic reactions. Disposable diapers often contain dyes and dioxin, which is formed as a by-product of the chlorine bleaching process. Dioxin is a carcinogen, which means it can cause cancer. When released into the environment, the toxin can accumulate in humans and animals. What Are the Effects of Non-Renewable Resources on Living Organisms?